Does Shrinkage Affect Your Natural Hair Style? Is shrinkage hiding the fullness of your natural hair style? I recently received an e-mail from a curly Q who wears twists as a natural hair style yet finds that it is not helping her hair to grow. If your health is fine and your hair is not breaking, it is always growing. However, shrinkage can hide this fact. Due to shrinkage I’ve actually believed at one time my hair was getting shorter or I was going crazy. Whichever one it was, I knew something wasn’t right. This confusion was even on an hour to hour basis. I would look in the mirror before leaving my house with a natural hair style of one length, wind up at a restaurant, go to the restroom and have a completely different style than I left with. Huh!!! What gives? With Curlformers, I’ve noticed the curl results are similar to those done on relaxed hair which was really shocking. I thought that perhaps if you set your hair in Curlformers, air dry and wrap it, perhaps you can have natural hair that is more stretched and you don’t have to apply heat to do it. 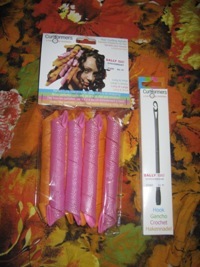 So here’s the contest, whoever can send the best pictures of strategies and results of stretching out natural hair without the use of any kind of heat (This means no blowdryers, hooded dryers or flat ironing allowed) with detailed explanations will win one long and wide pack of Curlformers and hook pictured above. You can try the Curlformers wrap idea or another stretching idea you have. I just want to know if there is another way to stretch natural hair other than braiding and air drying. The winner will have his/her pictures and detailed explanations posted on naturalhairgrows.com. The contest ends Thursday, April 30, 2009 at 4:00pm EST. Shrinkage is not the only thing that affects a natural hair style. Check out how breakage can stop natural hair growth before it starts.